Ho, ho, ho it’s the Christmas Season. We’re settled in Tucson and the weather is normal for the area. We’re sunny and getting a little cooler. They’re still putting our place back together – slowly – very slowly. I’m putting up the lights. 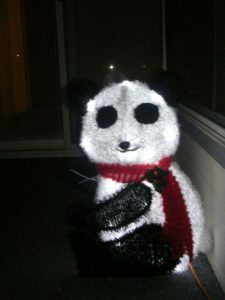 I found a light-up 22” panda which I love. And I’ve started playing Christmas music. NaNo was a bust this year. With everything else going on I didn’t get much done on Escape, the fourth book n the Hawkins’ Ranch series. Here’s a blurb for it. Amy has suffered abuse for years. Finally, she decided it was escape or die. Now she’s running for her life and she doesn’t trust any man. Gabe Hawkins, the oldest brother in the Hawkins family, has never found the right woman. His brothers are all happily married and he’s the only who is still single. Riding around the ranch he finds a skinny, terrified, poorly dressed woman in her late twenties. He’s not attracted to her, but he wants to protect her. That turns out to be harder than he thought. Even with the help of his family, can he keep her alive? Can Amy ever learn to trust a man? Her life may depend on it. And, The Fourth Victim Sara’s Story, is now available in paperback. Here’s the buy link https://www.amazon.com/dp/0991874897 You can also check it out and get the buy link on the Works by Beverley – Suspense page. The Newsletter I’ve been talking about for so long is finally ready to be sent out. I hope you’re on my list but if not, please sign up. Click on More – then click on contact and sign up there. I’ll only be sending it out every three or four months and I’m hoping to have something of interest for everybody. Also, please follow my blogs, guests and group blogs on my blog page. 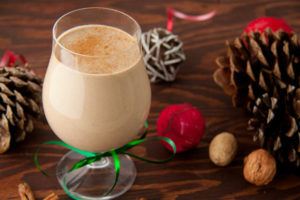 I’m putting a recipe in my newsletter, but I thought I’d share one for a Non- Dairy Eggnog here. Place all the ingredients in a blender and blend on high speed until very light and frothy, 1-2 minutes. Refrigerate until the eggnog is thoroughly chilled. Blend again briefly, then serve and top with freshly grated nutmeg. Enjoy! Have a wonderful Holiday Season and a Happy and Healthy New Year!